August 7, 2011: Washington, DC: There are people who say the city of Washington is lacking personality. But it depends where you look. For starters, the city's murals are evidence that this place has character. Many city murals are scattered throughout my old neighborhoods of Adams Morgan and Woodley Park. Marilyn Monroe graces the corner of Connecticut Ave. and Calvert St. just above two of my go-to Woodley spots, Eddie's Cafe chinese carry out and the diner called Open City. 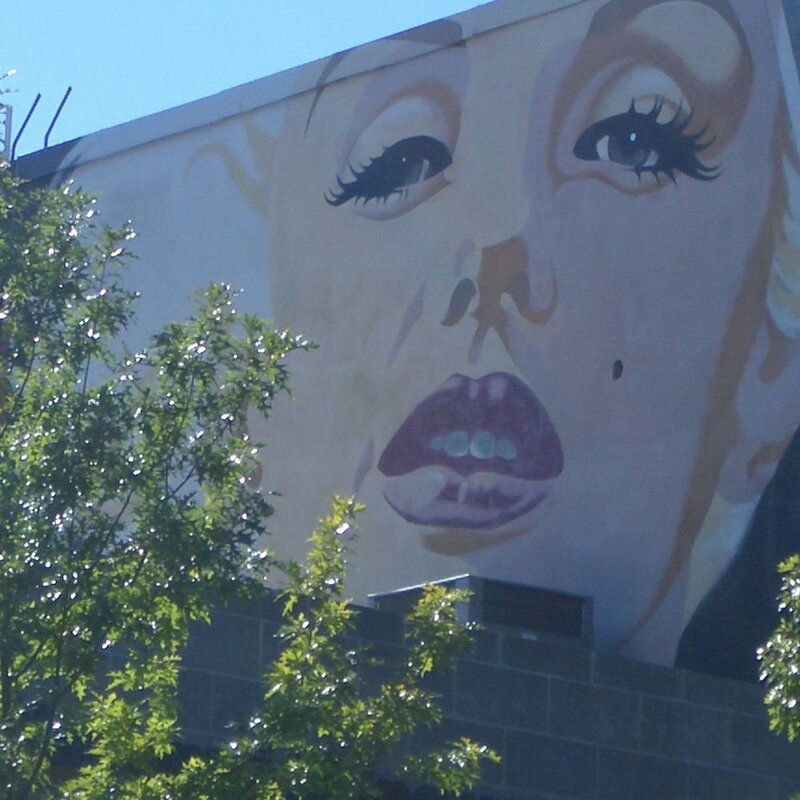 From up there, Marilyn might be able to see this presidential mural on the side of Mama Ayesha's restaurant, just across the Duke Ellington Bridge in Adams Morgan. That's Mama Ayesha there in the middle of the pack of presidents. Wasn't there another mural beneath this one, before work began on the presidents in 2007? Others in Adams Morgan are more obvious because they're front and center on colorful 18th St. There's Madam's Organ on the side of her namesake bar and there's a reproduction of a painting by Toulouse-Lautrec halfway down the same block. Others are political, like this one right around the corner from Toulouse-Lautrec by the flower shop. Or this one that popped up this spring over on U St., also advocating for D.C. voting rights. One block down, there's a mural that's been covered by new construction hidden to the left of this red brick building in the historic Shaw neighborhood. Wedged in there on the white brick next door, on the side of the bar Marvin, is an Obama mural painted by artist Shepard Fairey. Fairey's the man behind the famous Hope poster, and this one's a large version of the poster that says Progress. Another block down U St. in this historical hub of D.C.'s music scene is a tribute to jazz legend Duke Ellington. Ellington's childhood home is just a few blocks away. My new side of the city has public artwork too. On the east side of D.C., we have the mural that's been restored with the reopening of Senart's Oyster and Chop House. On the burgeoning H St. NE corridor there's a new mural on the side of Smith Commons. And one of my favorite finds over here isn't really a mural, but rather a series of old posters down by the Capitol Riverfront. On the pedestrian walk behind the Department of Transportation, near the ballpark in this growing neighborhood full of new highrises, is a great-looking nod to the past. I love how this one inspires us to stay on the move and keep exploring.